OK, so it's been out for awhile, but I recently stumbled across Lux Touch for the iPhone and have quickly become addicted. 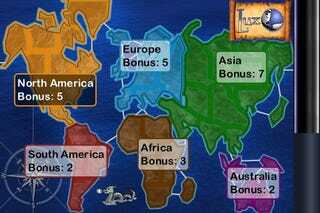 The free Risk knock-off for the iPhone and iTouch has you playing as the blue army in a bid to conquer the world. The four other players are all computer controller, but do a fairly good job of keeping things interesting. To play you just tap on countries to move your armies about or invade other bordering countries. The game is fairly simple, so simple that over time it can get a bit repetitive, but it's free. Also, according to developer Sillysoft Games, there appears to be a paid version, Lux Touch Dlx, in the works. Let's just hope it offers up online play, pass-the-device play and some amped up graphics. Oh, for the love of god, include a save feature next time around. If my bid to conquer the planet is defeated by a PR call one more time I'm going to kill someone.